Eugene Spearman, radio operator with the 384th Bomb Group, shares another of his great stories, this one about his eighteenth mission, 384th Bomb Group Mission #292D. On this day, March 19, 1945, the Nicolai crew flew as part of the squadron that made up the low squadron of the 41st “D” Composite Group. The primary target, the Braunkohle-Benzin Synthetic Oil Plant in Bohlen, Germany, was briefed as visual only, and was cloud-covered. The secondary target, which was also briefed as visual only, was not visible, so the number three target, Vomag Maschinenfabrik in Plauen, Germany, was attacked using PFF aiming. Our 18th mission was to Plauen, Germany. We had flown most of our missions all together with the same crew that we trained with in Avon Park, Florida. Our bombardier, Walter Robitzki, was chosen on this 18th mission to fly with the lead crew and we were given another crewman to be the one to act as togglier and drop the bombs from our plane. In early 1945, we didn’t have as many German fighters to worry about, but we did have plenty of flak shot at us. Walter’s lead plane was also carrying hot cameras, so they were expected to leave the formation and get back to England with the bomb damage photographs as soon as possible. After we dropped our bombs, we stayed with the formation and started returning to our base at Grafton Underwood, home of the 384th BG. Our engineer gunner, Joe Clemis, who lives in Spartanburg, SC, kept a private log of each mission and this is what he said: “No fighter opposition. Rocket almost hit our ship. The force from the explosion rocked our ship. Mission was 10 1/2 hours, 5 hours on oxygen. Weather real bad over base, but visual over target. 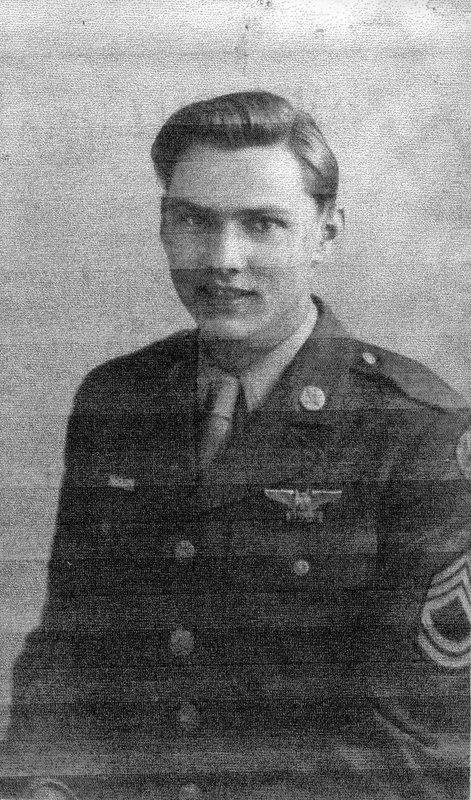 Saw Paris and Eiffel tower, also Brussels as we descended to a lower elevation.” Our bombardier, Walter Robitzki, and crew were listed as missing and later declared killed in action. I had tried for years to find out what had happened but was unsuccessful. In talks with my pilot, copilot, and others in the crew, no one knew any more than I did. They just didn’t return. In 1993, when we dedicated the Heritage Museum, I asked a lady employee there if she knew or could help me find out anything about Walter’s MIA status. This employee was Mrs. Phyllis Dubois from Alysham, Norwich, England. She promised to try and find some information and write me. Later, she sent me a casualty report that showed that the B-17, No. 44-8008, was sighted over Ostende, Belgium, at 11,000 feet at 1655 hours with no apparent damage. In June 2002, while looking at a webpage on my computer, I noticed an entry asking if anyone had any information about a crew that was MIA on a mission on 3-19-45. I answered the inquiry thinking that it might be someone who knew something about Walter. I was amazed and tremendously pleased to find that it was Walter’s nephew. Needless to say, we have shared pictures, stories, and just chatted back and forth by e-mail and letters, and still have lots of catching up to do on events that happened on 3-19-45. I just wish that Walter’s mother was still living so I could chat with her. Walter Robitzki’s name is inscribed on the Tablets of the Missing at the Cambridge American Cemetery and Memorial in the UK. Ostende, Belgium is less than two miles from the English Channel. By thearrowheadclub in 544th Bombardment Squadron (Heavy) on March 30, 2016 .